Priorclave has launched the MVA C40 benchtop vacuum autoclave, meeting requirements of laboratories wanting to perform low-volume sterilisation of items such as tubing, bagged mixed plastic waste, and narrow bore glass ware. This model has a five programme memory fitted as standard, giving the user the flexibility to switch the highly effective sterilising process easily from vacuum assisted to non-vacuum dependent on load. Effective sterilisation to destroy micro-organisms requires direct contact between the saturated steam and every surface of the load. The presence of air in the load can prevent direct contact with micro-organisms which are held inside tubes, deformed petri dishes, etc., by applying a vacuum at the start of the cycle greatly improves air removal, assisting with full steam penetration. If a vacuum cycle is selected, the MVA C40 benchtop autoclave forcibly removes residual air from within the chamber and load using multiple vacuum phases programmed with interspersed heating. This highly efficient process allows the steam to circulate freely, ensuring deep penetration into the load for highly effective sterilisation. A vacuum assisted cooling cycle, is also available for use with suitable load types, reducing the dead-zone whilst waiting for the autoclaves to reach a safe temperature and pressure. 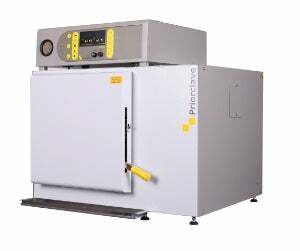 The Priorclave C40 benchtop vacuum autoclave has a 40l (350mm dia x 420mm deep) stainless steel chamber and features the Quickseal single-action door. This enables one-handed operation of the door mechanisms for easier load and retrieval. To prevent accidental opening at load temperature above 80°C and pressures above 0.2bar it carries safety attributes of thermal and pressure locks. An option for this model is the ability to run a vacuum drying cycle at the end of the sterilising cycle. When correctly operated and set up this compact autoclave can achieve good levels of dryness in textile and other porous loads in non-medical applications. The Priorclave MVA C40 is part of a comprehensive autoclave range that includes front loading autoclave, top loading autoclave, and power-door autoclave as well a double door steam sterilisers. In total Priorclave has developed more than 60 standard models as well as providing a purpose design and build service. The company has also introduced a much extended range of accessories including biological indicators, which can be used to verify that significant numbers of the most resistant spores have been inactivated under chamber conditions.